A proven all-rounder, the Ezytrail Stirling GT MK2 is a reliable rig that has plenty of storage, lots of 12V power and offers great value for money. The Ezytrail Stirling GT MK 2 you’re looking at isn’t brand new. It spent the better part of the last year being hauled with no mercy around the country in front of a camera crew for a 4WD touring show. So we figured it was the perfect opportunity to not only get a look at a new model, but also see how it can hold up against real-world abuse. So what sort of battle damage could you expect your Stirling GT MK2 to come back from a season on a 4WD show with? Surprisingly little actually, with the only real major damage we could find was that the back has copped a serious hit at some stage, although the rear protection bar took most of the brunt. The lights still work, the bar still opens and closes to access the spare tyre, and despite copping a few dents of its own the storage box it protects still seals and closes properly. I’d chalk that up as a win. The inside has held up better than expected too. Despite sitting in the rain there had been no water ingress, no mouldy tent and no rips or tears even though a few of the latch pins had gone AWOL. The Stirling GT MK2 is no featherweight, but it it tows relatively easy with a good balance front to rear, and a reasonably supple suspension setup keeping it in line behind the tow-tug. Setting up is a relatively uneventful affair with two people, and if you had a boat on the rack the front and rear hand winches will do the hard yards. 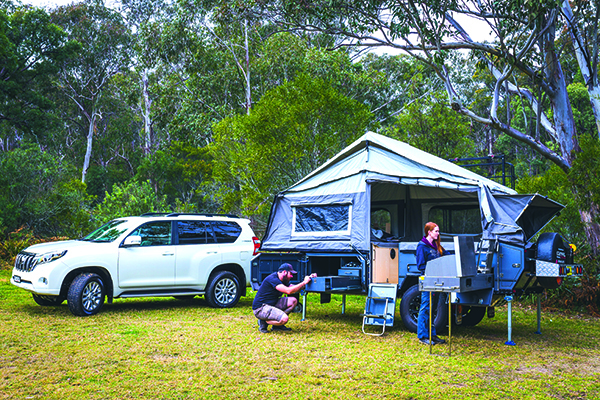 The whole point of camper trailers is to make camping nicer and the Stirling GT Mk2 has plenty of shiny stuff to get that done, with a typical CD player setup and DVD player inside, which can be wired up to a lift-out 17in TV hidden under the lounge. 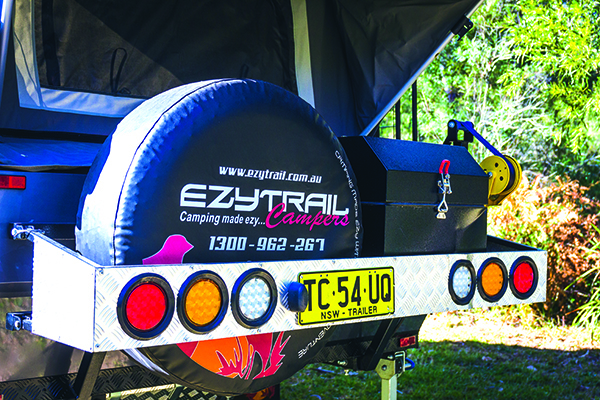 The EzyTrail is a great option for people after an affordable camper trailer that’ll they’ll actually enjoy using without crying every time they see the repayment amounts. The Ezytrail Stirling GT MK2 is priced at $19,990.